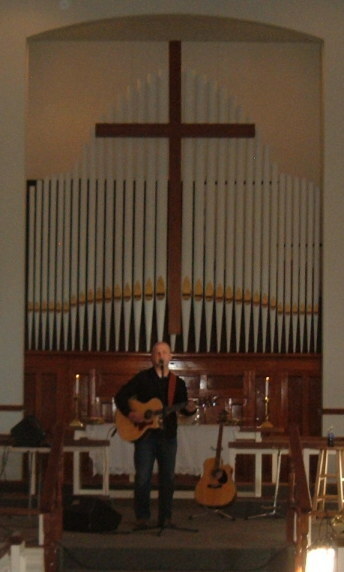 Music has always been a big part of our church life. 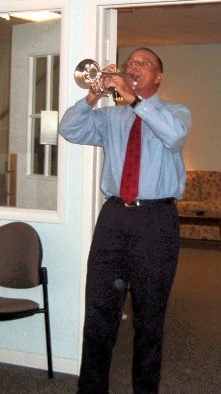 The church has a bell choir for youth and adults, and musically talented members get involved. 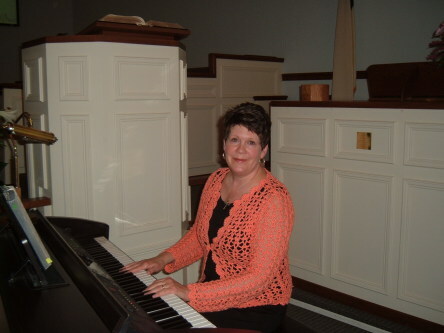 Sunday morning services feature music on the Clavinova by our Music Director Karen Foster. 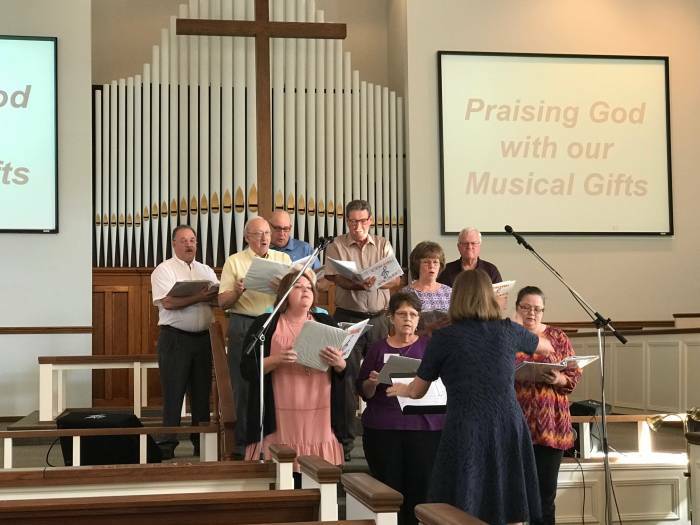 Our church has an active choir. 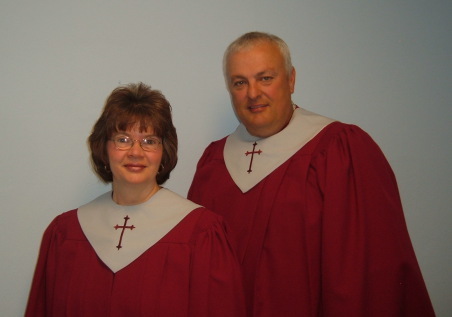 They sing at every Sunday morning service, and at special services and events throughout the year. These include both Easter and Christmas Cantatas. 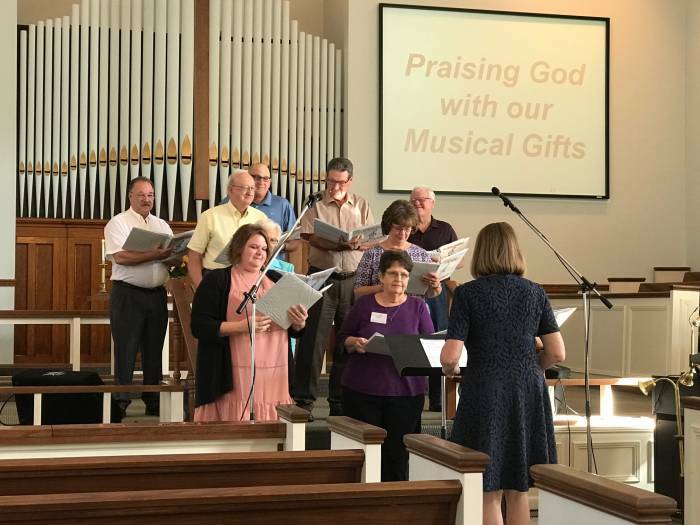 The church choir, led by our Music Director Karen Foster, sings for worship services. Choir practice is Wednesday evenings from 7 to 8 PM in the choir room. 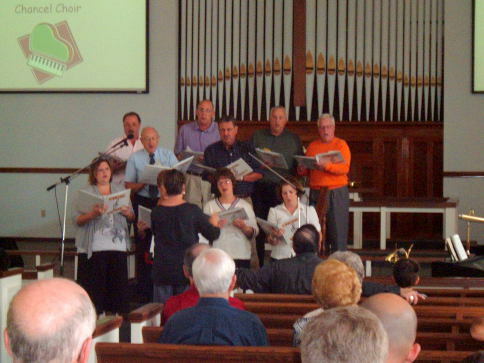 Here we see the choir singing during a service. 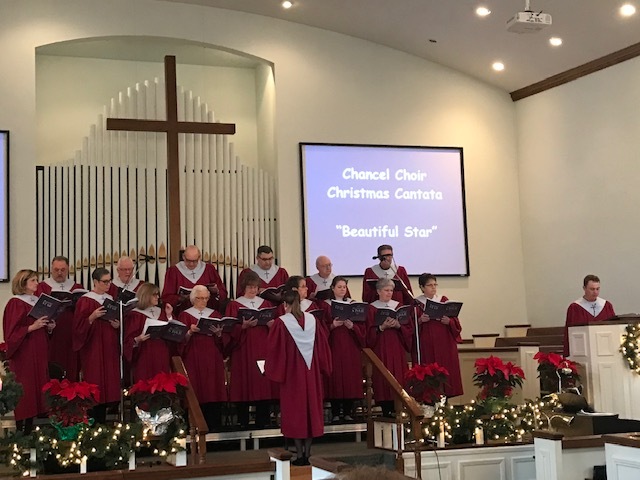 Some members of other Paoli church choirs joined our choir to present the very popular Christmas Cantata. 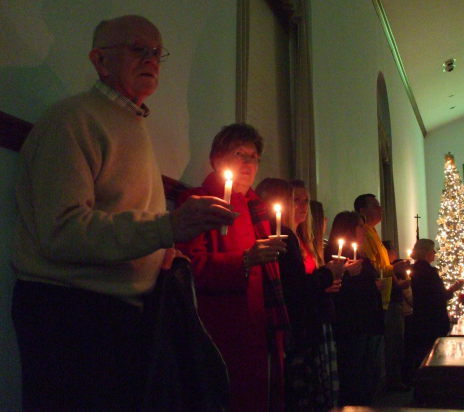 Members of the Paoli United Methodist Church sing during a candlelight Christmas Eve service. 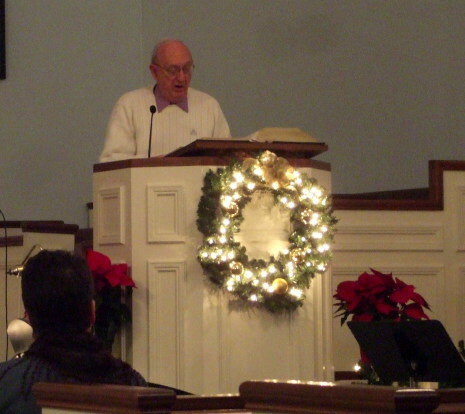 Howard Detweiler performs a special song during a Christmas Eve service. A pipe organ built by Henry Pilcher's Sons in Louisville was installed in the old church building just west of the square in 1927. 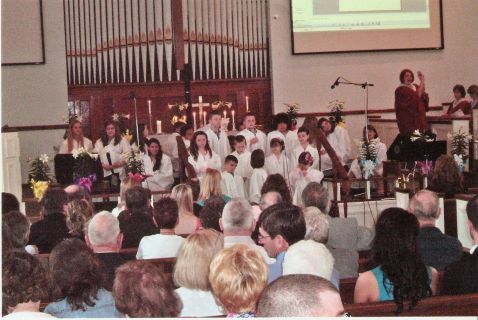 That same pipe organ is still in use, having been moved to the new church building in 1972! It was fully rebuilt in 1985, at which time additional stops were added. It has two manuals and a pedalboard. Its current specifications are shown in the table. Above we see Sara Barnett Seidner playing the pipe organ for a service. Below is the scene from 1972 when it was being disassembled for the move. Also see the letter from Maud Anna Ham written around 1968, and the letter from Mildred Hamm Moss written in 1984, both about the 1927 purchase of the organ. 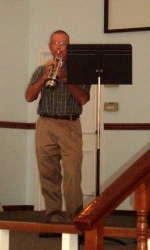 We sometimes have a special musical performance during Sunday morning worship. 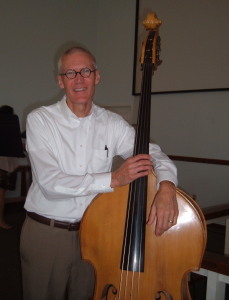 Kirby Stailey was born and raised in southern Indiana and began singing in church at the age of 5. During his youth he played bass and acoustic guitar and sang lead vocals in a variety of bands playing styles including heavy metal, blues, rock and roll, and country. He won the Colgate Country Showdown in Jasper, Indiana, and recorded both his winning songs on an EP titled "We Know The Way". He has already begun writing songs for his second CD and hopes that God will allow him to continue to minister through his music. 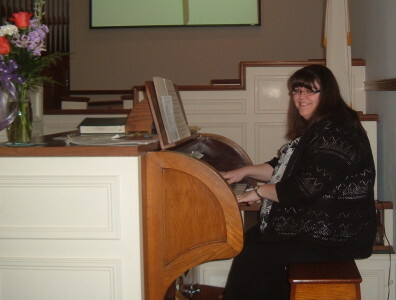 Darla McFadden has performed her music multiple times at our Sunday morning services.